Join us each week for new low fat cooking tips, methods of food preparation, ways to cut the fat, calories and cholesterol in your favorite recipes. You will find low fat baking tips, how to use fresh herbs and spices, onions, peppers, garlic and leeks to add flavor when you delete oils and fats. We often preview exciting new low fat recipes that have unusual preparation and new low fat products in the tips section as well. 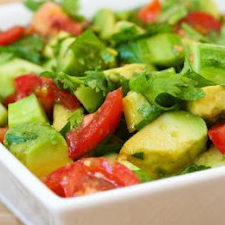 My favorite salad for summer cookouts is Salsa Salad. It really has not salsa in it but it reminds me of a big chunk pico de gallo with avocado in it!!! Serve with any grilled meat or poultry - & perfect with Mexican food. Serve as is or over a bed of salad greens. COOKS NOTE: The seasonings on this can easily be adjusted to taste. I have started out low, so feel free to add more to your own personal taste. Per Serving: 118 Calories; 8g Fat (55.8% calories from fat); 1g Saturated Fat; 2g Protein; 12g Carbohydrate; 3g Dietary Fiber; 0mg Cholesterol; 150mg Sodium. Exchanges: 0 Grain(Starch); 1 1/2 Vegetable; 0 Fruit; 1 1/2 Fat.